While I have been wittering on about braiding, colour and drafts, there is actually a whole bunch of stuff about the Albuquerque trip I haven’t even mentioned yet. 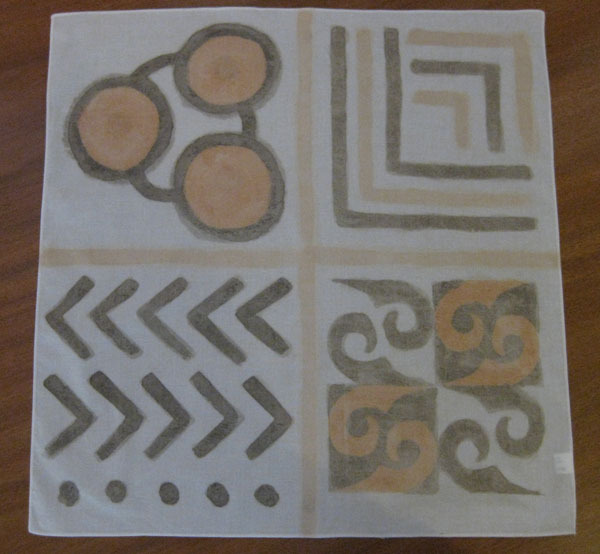 One thing that hasn’t had a look in is the class I took in making mud cloth. As you may have noticed, if you’ve been reading this blog for a while, I am not especially enthusiastic about dyeing. However, I did (a) think that playing with mud was right up my street and (b) want to try things I wouldn’t normally select. So I signed up for Judy Dominic‘s half-day class in “modified bogolan fini”. If you read Judy’s page about mudcloth you will learn that the traditional process of bogolan fini (literally “mudcloth”) which is practised in Mali cannot be done outwith that region as the precise combination of water, plants and mud simply isn’t present anywhere else. However, Judy has adapted the technique, using skills from her other areas of interest such as papermaking, and come up with a way of making mud cloth wherever you can get mud. Yes, while other folks were painting portraits and sophisticated Escher-like interlocking fish designs, I was daubing big splodgy circles and feeling quite advanced. The fancy curlicues in the bottom right were from a stencil, so none of my own doing I’m afraid. The final colours you get using this method are less saturated than the original mud colours, so if you want real richness then you have to apply more layers. However, I am quite amazed that I have as much colour left in there as I do — I had really expected much more to wash out. I am sorry that I wasn’t quicker though, as I would have liked to decorate a shirt. Nothing to stop me doing that at home, except that our mud is just plain brown! I’ll bet you can buy supplies of refined muds from craft catalogues, but … buying mud? I am not sure I am ready for that. On the other hand I did buy a box of ochres for a friend when we visited Provence — perhaps it is time for another holiday down there. I love your cloth! And your comment about buying mud made me smile, Cally. My husband is a baseball umpire during his off-hours, and he buys a special mud to rub up the baseballs. I think it’s about $14 an ounce. Secret family recipe, too…there’s only one place in the country where umpires can buy their mud, and heaven only knows what’s so special about it! that is really amazing – very chic! I can see a shoulder wrap done in the lovely circle pattern you made. Perhaps what you might do is while travelling on the continent, or even here in the UK – where the geology changes (example devon vs. scotland etc.) – collect samples to play with – or even ask friends to bring you some dried mud from their travels. Once you get a collection (labelled) you’ll then know what you like and can go and retrieve more as needed. Cally – Your cloth looks grand! I’m glad you enjoyed the class. And when the word gets out, you’ll start finding packages of mud coming your way from all over! Have fun with it!